On 8 August 2017, Pravit was charged by the Technology Crime Suppression Division (TCSD) with one count of sedition (Section 116 of the Criminal Code) and of violating Section 14(3) of the Computer-related Crimes Act for authoring two Facebook posts which criticized the draft charter of Constitution and General Prayuth. Pravit is a senior staff writer at the newspaper Khaosod English. His journalism and social media commentary (Facebook and Twitter) actively criticizes the NCPO. He has twice been forcibly detained in communicado at ‘attitude-adjustment’ camps (from May 25-31, 2014 and from September 13-15, 2015 respectively) due to his frequent anti-NCPO criticism. At the time of his detention, he was working at The Nation, and was asked to resign. Pravit duly complied. In March 2016, the NCPO has also banned Pravit from travelling to Helsinki, Finland, to celebrate the World Press Freedom Day. He was invited by UNESCO to attend the event as a guest. He was awarded the 2017 International Press Freedom Award by the Committee to Protect Journalists. After a five-hour meeting (from 1.30pm to 6.30pm) at the TCSD office on 8 August 2017, Pravit faces one charge of sedition (violating Article 116 of the Criminal Code) and violating Section 14(3) of the Computer-related Crimes Act for two Facebook posts that he authored on 16 and 17 February 2016. For authoring both these Facebook posts, Pravit faces a charge of one count of sedition and violating Section 14(3) of the Computer-related Crimes Act. This count carries a seven-year prison penalty. On 8 August 2017, Pravit went to report at TCSD headquaters after recieving a phon call to go to be informed the charges. 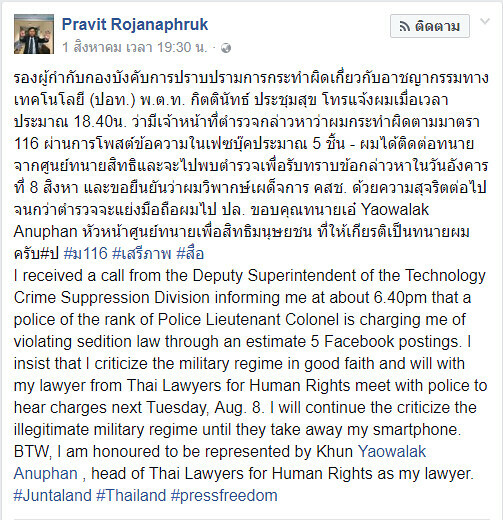 Pravit posted a message on his personal facebook account stated that Deputy Superintendent of the Technology Crime Suppression Division informed him by telephone call that an accusation under sedition charge (section 116 of the Criminal Code) had been filed against him by the polices. Pravit also stated on the status that he need to report himself with the TCSD on 8 August 2017. 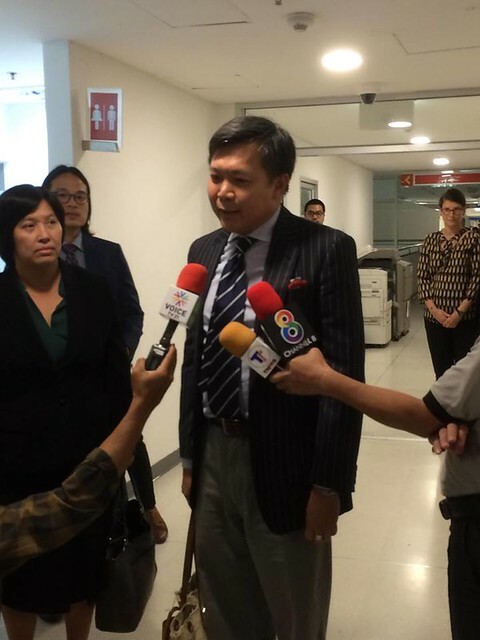 Pravit and his legal representatives from the Thai Lawyers for Human Rights (TLHR) reported to the inquiry officer at TCSD headquaters at 1.30pm. Also present were media groups covering the case, representatives from thhe embassies of Canada, Germany, Sweden, UK, France and the EU Mission, and representatives of NGOs such as the International Commission of Jurists (ICJ). Pravit and his lawyers entered the meeting room with the inquiry officials at 1.45pm. The rest of the observers had to wait outside the meeting room throughout the duration of the meeting. The hearing of the charges lasted approximately 5 hours. The TCSD officers also informed Pravit to present himself for another meeting at their headquarters on 18 August 2017 (at 1pm) where he could be informed of a separate and additional charge of sedition and violation of the Computer Crimes Act for authoring five other Facebook posts.